In order to avoid the constant backlash of criticism concerning the previous Fire Eaters Meeting Reminders being unprofessional, outrageous, undisciplined, irreverent, unprincipled, and generally rude, crude and outlandish; this Fire Eaters Meeting Reminder will strive to be totally professional, low key, and most respectful in every way, such that all can be proud of the caliber of invitation you receive in your email mailbox when it relates to the Fire Eaters Meeting Reminder. NOW HEAR THIS: Each and every one of you get your *****&&##?? ****** lazy hips in gear and mobilize your buns down to Anna’s Italian Restaurant on Mechanicsville Turnpike this coming Wednesday evening, October 5, at 6:00 p.m. for dinner and 7:00 p.m. for the Floor Show, starring “Jumping Jimmy and his Rockin’ Rebels” performing all manner of lewd and suggestive songs, accompanied by the Fire Eaters Dance Ensemble. There is no cover charge for this one night stand, I mean performance. In addition to the foregoing, we will have two speakers providing a tag team presentation about the CSS Shenandoah, and its exploits. Our speakers are Gary Hall and his colleague, Byron Brady, who spoke to us last month. The Edmund Ruffin Fire Eaters sponsors the Captain Sally L Tompkins Chapter 2 OCR. 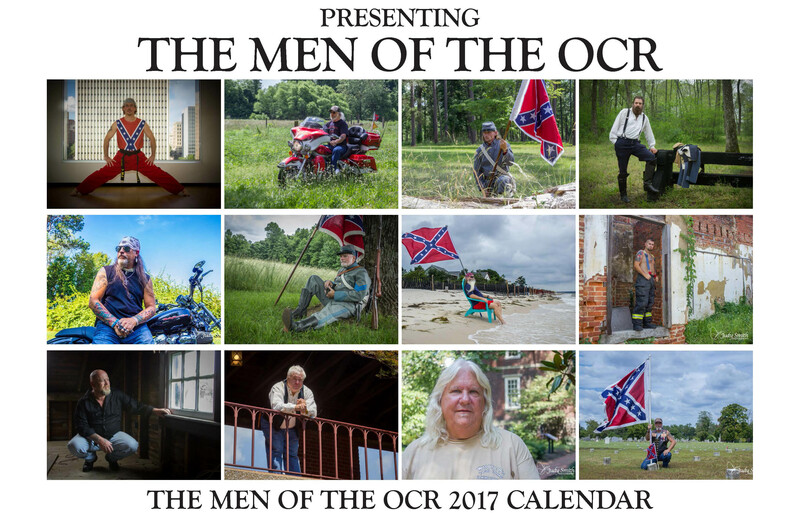 Out ladies have put together a calendar of the “Men of the OCR” as a fund-raiser for their ongoing Tombstone Project. Learn more about their project by clicking on the image below. The September edition of The First Shot is now available. Download your copy now!. Katherine Mason Rowland Marker Dedication, Sunday September 11 at 2 PM. Please be there by 1:30 at the latest. There will be directional signage posted at the cemetery. Katherine nursed at hospitals during the War in Virginia. When the United Daughters of the Confederacy was born, Katherine helped form many Chapters in Virginia and Maryland. It was Katherine’s work that helped form the Virginia Division and was elected Division Historian for 1895. She was elected Corresponding Secretary General in 1896. She also served as Vice President for the Board of Managers in Maryland. She was a noted author on her ancestors George Mason and editing the first edition of Minor’s “The Real Lincoln”. She was an unreconstructed Confederate lady. This cemetery is one of the most beautiful cemeteries in the South with statuary that is outstanding. Many dignitaries from UDC General, Division, and Chapter levels will be attending. There will also be another Color Guard, The Harry Gilmor Camp of Baltimore, representing Maryland at this event. All are welcome at this event. I need to know who is coming so that all needed equipment and flags are there. The August edition of The First Shot is now available! Download your copy here! This is a very important document and announcement! Do not lose this Very Special and Personal Invitation to attend the next Fire Eaters meeting on Wednesday, September 7, 2016 at 6:00 pm. at Anna’s Italian Restaurant on Mechanicsville Turnpike across from Lee Davis High School. If you are unable to produce this Invitation at the door, the Sergeant At Arms may scrutinize your SCV membership card, or your UDC card, or your OCR card, or your ANV Mechanized Cavalry card or your VA Flaggers card before allowing you to enter this Very Special Event. So keep this Invitation in your possession at all times. This Invitation will allow you, your family members, your friends, your visitors, your guests and anyone you happen to pick up by the side of the road on your way to the meeting, to enter our hallowed hall to participate fully in all of our ceremonies. If you have heard of the ridiculous and outrageous local, state and national media reporting of our last meeting, please do not be afraid to attend the September 7 Fire Eaters meeting. Everyone knows how the media gets everything wrong, exaggerates everything, and produces sensational headlines and news stories to gain attention. The local, state and national media have been absolutely out of control in attempting to besmirch the reputation of the Fire Eaters and one table at our meeting in particular. I am here to officially announce to you that there is absolutely no truth to the vicious rumor appearing nationwide in the media that a certain boisterous table at our last meeting (EVERYONE KNOWS WHO I AM TALKING ABOUT!) was ejected by force from the meeting room, including the table, chairs, meals, drinks, silverware, condiments and napkins, and that all participants at the involved table were required to sit and remain outside in the parking lot for the duration of the meeting due to their loud laughter and festive atmosphere surrounding the table and adjacent areas. This is untrue, and absolutely did not happen in any way shape or form!! However, you never can tell what will happen at the upcoming meeting. Frivolity and festive behavior, including loud laughter, are hallmarks of a successful Fire Eaters meeting. So do not be afraid to attend, because you will really be missing out on something special and important. Folks who laugh long and loud live longer than those who sit around frowning and displaying a gloomy attitude. It is a scientific fact! To insure that this type of scandalous reporting by the media is not repeated, our Judge Advocate has been instructed to file a vigorous protest and to issue a firm warning to the local, state and national media to refrain from such activity in the future. What: September Fire Eaters Camp #3000 meeting. When: Wednesday, September 7, 20016 at 6:00 p.m. for dinner, and 7:00 p.m. for the formal meeting. Where: Anna’s Italian Restaurant, Mechanicsville Turnpike, Mechanicsville, VA, across from Lee Davis High School. Speaker: Byron Brady, speaking on the escape route of John Wilkes Booth. This is an important meeting, and we need everyone to attend. Please plan to be there. Our Camp Commander has promised fireworks, so let’s get there to fill the room and enjoy a fantastic Southern down home get together, and have some fun. The Governor is out of town, so we won’t disturb him for a change. See you there this coming Wednesday.